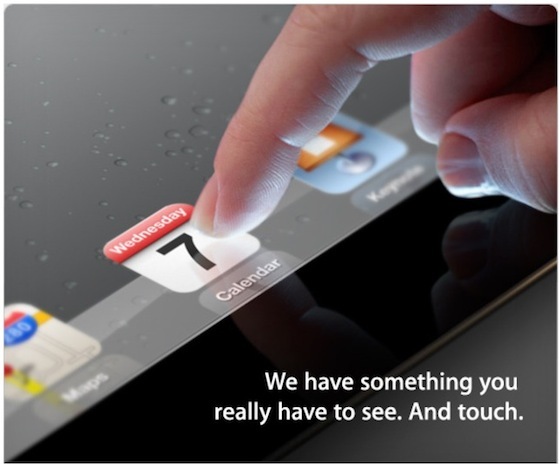 iPad 3 To Be Called "iPad HD"? More Evidence That The iPad 3 May Actually Be Called “iPad HD”? According to CNet, Apple’s 3rd-generation iPad which expected to be named numerically as the iPad 3, will in fact be launched as the “iPad HD”. Given the iPad 2 followed the iPad, it makes sense that the iPad 3 should follow next but some accessories manufacturers have also referenced the “iPad HD” name giving credence to the rumor. The “iPad HD” moniker first appeared back in July 2011, where This Is My Next reported that a new iPad with a screen resolution of 2048 x 1536 (the same resolution confirmed on the new iPad 3 screen) would be released with a range of Pro apps. The iPad 3/iPad HD will be announced at a special Apple Media Event on March 7 being held at the Yerba Buena Center for the Arts in San Francisco at 10 AM PST.